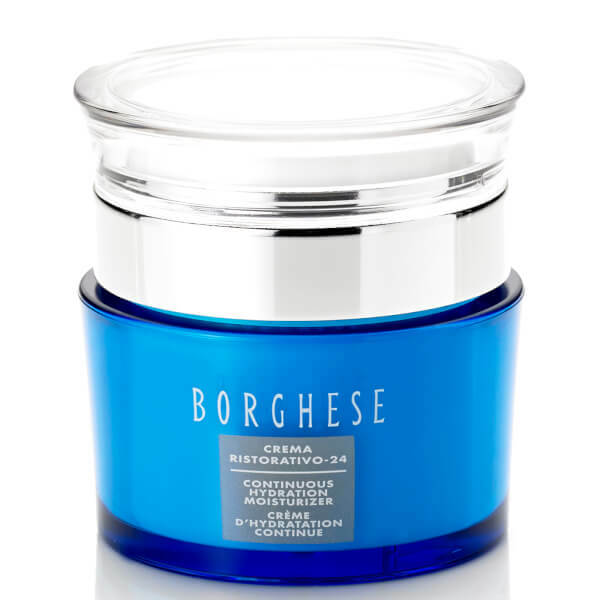 Intensely nourish skin with the Borghese Crema Ristorativo-24 Continuous Hydration Moisturiser, a lightweight gel-cream formula that delivers 24 hours of moisturising care. Infused with powerful marine extracts and two patented ingredients, the hybrid moisturiser expertly softens, hydrates and combats dryness whilst protecting against environmental aggressors to keep skin looking healthy, supple and radiant. Its long-lasting hydrating properties leave the complexion velvety soft with a youthful glow. Water (Aqua), C12-20 Acid Peg-8 Ester, Dipentaerythrityl Hexacaprylate/Hexacaprate, Vegetable (Olus) Oil, Butylene Glycol, Caprylic/Capric Triglyceride, Glycerin, Imperata Cylindrica Root Extract, Citrullus Lanatus (Watermelon) Fruit Extract, Pelvetia Canaliculata Extract, Astrocaryum Murumuru Seed Butter, Salicornia Herbacea Extract, Nicotiana Sylvestris Leaf Cell Culture, Sodium Hyaluronate, Laminaria Ochroleuca Extract, Hyaluronic Acid, Hydrolyzed Corallina Officinalis Extract, Hydrolyzed Collagen, Adenosine Triphosphate, Collagen Amino Acids, Potassium Cetyl Phosphate, Dimethicone, Tocopherol, Fragrance (Parfum), Carbomer, Propylene Glycol, Acrylates/C10-30 Alkyl Acrylate Crosspolymer, Sea Salt (Maris Sal), Sodium Sulfate, Potassium Chloride, Sodium Carbonate, Sodium Chloride, Sodium Hydroxide, Disodium Edta, Phenoxyethanol, Caprylyl Glycol, Sodium Benzoate, Potassium Sorbate, Dehydroacetic Acid, Benzyl Alcohol, Ethylhexylglycerin, Linalool, Limonene, Hexyl Cinnamal.